Renowned for being very ugly and cruel creatures who could be found dwelling under rocks, deep in mysterious forests and in dark caves, Trolls are legendary creatures of Norse mythology. 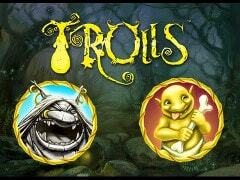 The thought of coming face-to-face with hideous Trolls may send a shiver down your spine and see you navigating the cursor towards the exit button in the tab of your browser, stop right there because the Trolls video slot, which is powered with software by Net Entertainment (NetEnt), shows the creatures in a different light. While they certainly don’t appear as oil paintings, they are more cute and cheerful than one would usually imagine, and despite rarely being helpful towards humans, they show a softer and more generous side which often sees you leave their habitat with memorable wins. Set in a mysterious forest where you will see large carved stones surrounded by trees and curling vines, you’ll hear beautiful sounds of nature as you take a stroll through the magical Norse habitat in search of a family of Trolls. Your Norse journey sees you explore 5 reels and 20 paylines and you could find yourself cashing-out of your favourite online casino with up to 120,000 coins if the Trolls take a shine to you. It’s clear to see how once you take a look at the pay table as there are standard Wild symbols, Golden Wilds that only appear on the third reel, plus Scatter symbols could see you spin the night away under the full moon in an exciting free spins game! This free Trolls slot machine isn’t one of NetEnt’s latest releases, which is clear to see from the old styled interface that features, however both the background and symbols have been designed brilliantly to capture the magical atmosphere of the mysterious forest that is home to a family of generous Trolls. Before we describe the family of Trolls that you’ll meet, let’s look at the three special symbols which feature on the pay table. There is a standard Wild symbol that is represented by a tree stump which delivers magical wins of up to 10,000 coins and whenever it is part of winning combinations they will be doubled in value. The Golden Wild only appears on the third reels but whenever it shows up as part of a winning combination, the prize will be quadrupled. Finally, the Scatter symbol is a stunning view of the full moon late at night and this will see you claim huge Scatter wins and see the Trolls present you with the gift of free spins. Now onto the family members that you’ll meet and be hoping to see the generous side of. The leader of the pack and most valuable of all is the gold-faced, crown wearing King who can spoil you with up to 750 coins, the matriarch of the family who holds a basket of food and ensure nobody goes hungry will see you feast on up to 500 coins, the protector of the family who is armed with a wooden club can also lavish you with up to 500 coins, the scariest and ugliest Troll in the family with a ring through his nose is worth up to 250 coins, as is the baby Troll who can be seen playing with a large bone, while the final Troll in this family resembles a garden gnome and he will gift you up to 200 coins. During your adventure through the Norse habitat late at night you will also find Ace to 10 symbols which have been made from branches and knotted together with vines. The full moon provides just enough lighting for you to navigate your way through the forest without stumbling over branches and rocks, and your face will light up as bright as it whenever you trigger the free spins bonus game. You’ll need three or more Scatter symbols for the feature to begin with three appearing at the same time seeing you claim 10 free spins and 5x your stake, four brightening your evening up with 20 free spins and 25x your stake, while the rare sight of five Scatters on the reels at once will see your eyes light up with 30 free spins and 500x your stake. Oh, and all winnings during free spins are tripled - who said Trolls weren’t kind to humans?! As already alluded to, Trolls are regarded as cruel creatures who were rarely helpful to human beings, but that’s certainly not the case in the Trolls slot machine from NetEnt as they rarely see you leave their habitat without huge wins to ensure gamblers become their friends and make plenty of return visits.